Season meat with Adobo. In skillet, heat oil on medium high. Brown meat on both sides. Remove and keep warm. Lower heat to medium, stir in garlic, onion, and green pepper and cook stirring often until vegetables are soft, about 10 minutes. Stir in black pepper and tomato sauce and cook, stirring often for 5 minutes. Stir in Sofrito, water, Sazón and Bouillon and bring to a boil. Return meat to pan, cover, lower heat and simmer for 45 minutes stirring occasionally. Stir in the Capers and Olives and continue to simmer, covered until meat is very tender and shreds easily, about 1-1 ½ hours. Add more water, ¼ cup at a time, if sauce gets too dry. 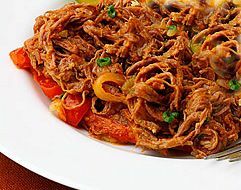 To serve, shred meat with 2 forks, mix back into sauce. Serve with white rice.